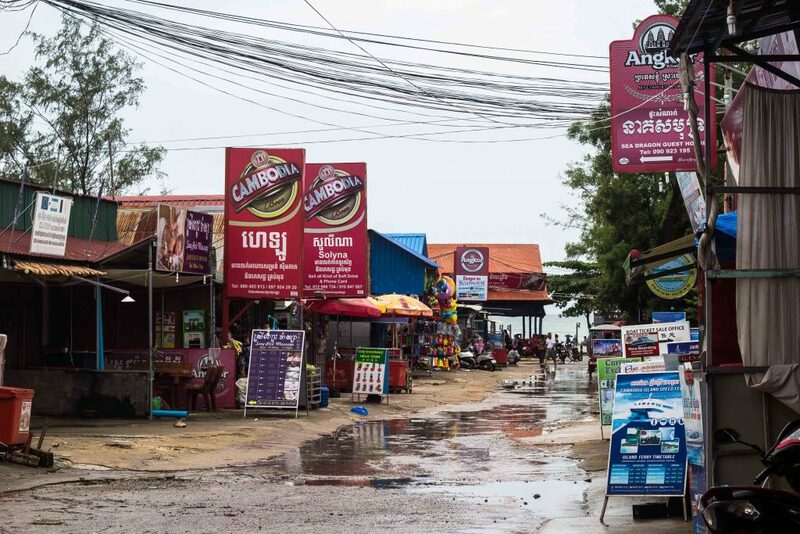 A beach town on the coast of southern Cambodia, Sihanoukville (or “Snooky” for short) doesn’t exactly have the best reputation in Southeast Asia. The stereotype is that Westerners who flock there fall into two categories: glassy-eyed backpackers who drink from buckets all day and take copious amounts of drugs at night, and elderly sexpats who stumble around in perpetually-open Hawaiian shirts, spending what little pension they’re receiving on the chance to have a wife, girlfriend, or nightly companion a third their age. Doesn’t paint a pretty picture, does it? But the truth is that all kinds of travelers come to Sihanoukville, which is also home to some of the most beautiful beaches in Cambodia. 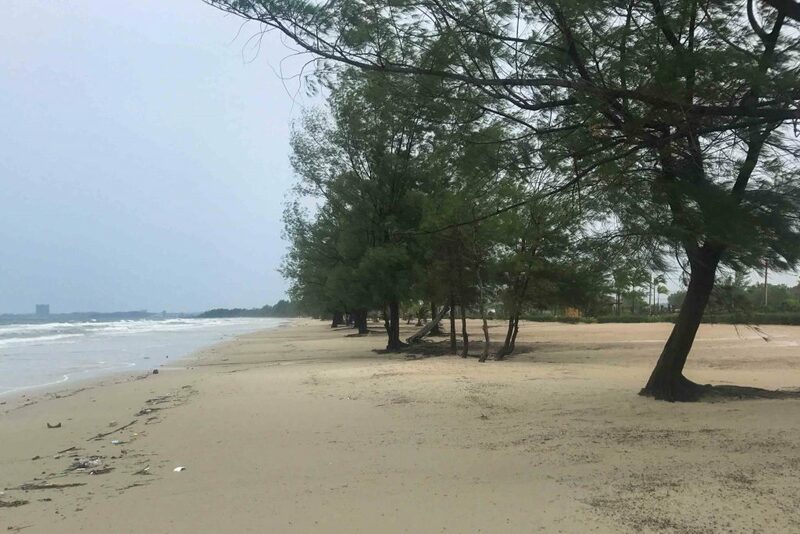 While Sihanoukville is known for Ochheuteal Beach right in town, nearby Otres Beach is just as big of a draw – and the laid-back atmosphere there is more my speed. It’s only four miles from town, or a twenty-minute mototaxi ride. I was hoping to see a different side of this reportedly seedy hotspot, and with Jen busy teaching yoga in Kampot, I had some time to explore. I stayed just 24 hours in Sihanoukville, enough time to see everything I hoped to without getting overwhelmed by its hedonistic vibe. My journey to Sihanoukville started in sleepy Kampot, a place you’d never mistake for a party town. 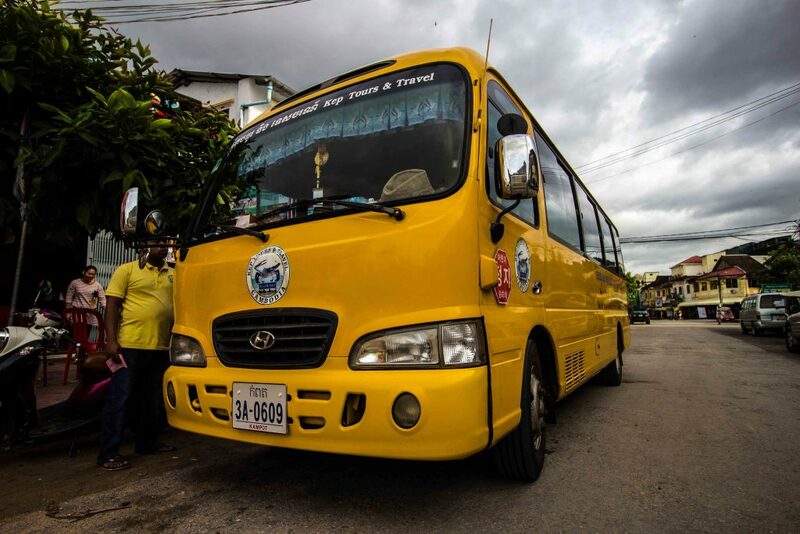 From there, the trip takes just over two hours on a minibus (you can also ride the much more comfortable train, but it takes slightly longer and drops you off farther from town). If you’re coming from Phnom Penh, you’ll pass through Kampot a little over halfway through the ride. The scenery during this section of the trip is fairly uneventful, with only views of rice fields to pass the time. 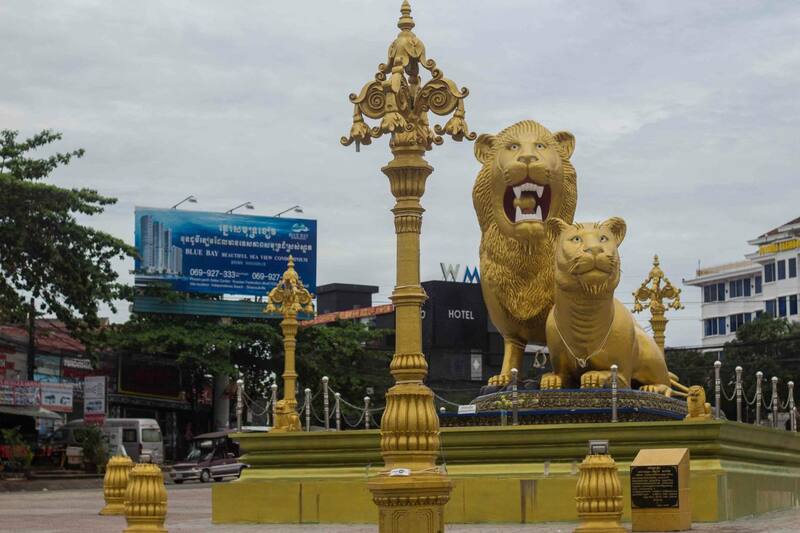 Upon reaching Sihanoukville, most of the bus companies drop off next to the Golden Lion Roundabout (you can’t miss the large unattractive statue in the middle of it), a couple blocks from the famed Ochheuteal Street and Beach. At just past ten in the morning, there’s not much going on in this city primarily known for its nightlife. But whenever I’m in a new place, one of my favorite things to do is visit a local market. I’m a big fan of farmers’ markets back in the States (especially when they invite some food trucks! 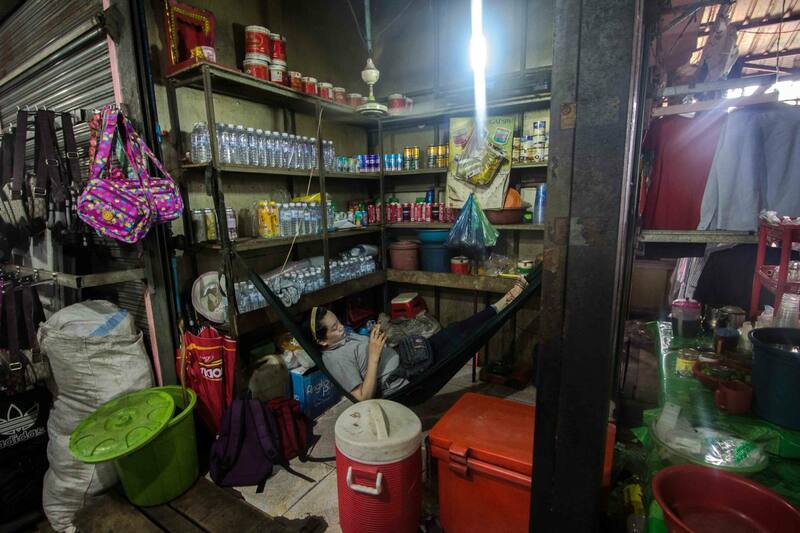 ), but there’s nothing quite like the local markets in Asia. They’re crowded, chaotic, and full of life (and death, actually – there are a surprising number of animals being slaughtered and butchered at most markets). In any case, there’s always something interesting to see as the locals do their daily shopping, and it’s a great place to snag a deal. 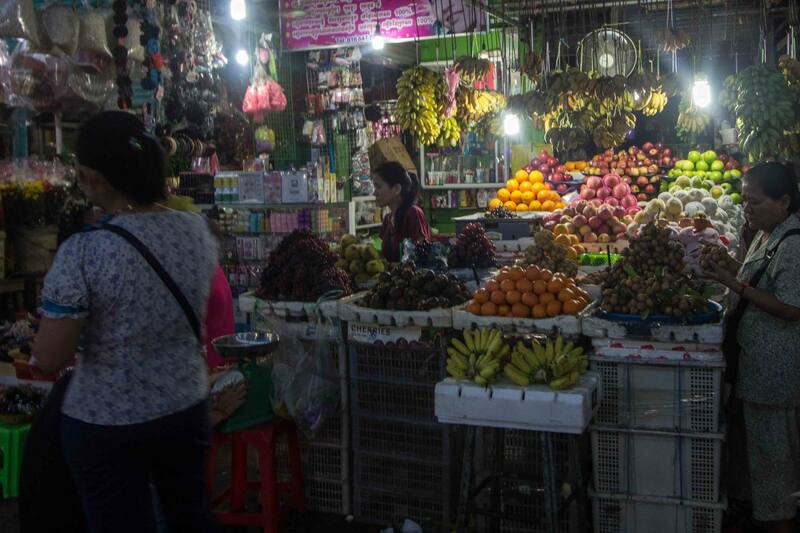 The central market in Sihanoukville is a little over a mile from the roundabout, an easily walkable distance if you have the time and want to see more of the city. If not, there will be plenty of mototaxi drivers waiting when you get off the bus. From the outside, the market looks like a big blue warehouse surrounded by hundreds of bright umbrellas, awnings, and motorbikes. But once you walk inside, it’s almost like a mini-city. There are stalls for hairdressers, next to butchers, next to gold dealers, next to clothing retailers. There’s only a vague semblance of an organizational structure, which makes it all the more exciting to just roam around. I didn’t have much shopping to do, so I just bought a deliciously sweet Cambodian donut and perused the stalls for an hour or so. While the area near the Golden Lion Roundabout has plenty of options for the hungry tourist, ranging from wood-fired pizzas to the typical noodles and curry, I was excited to try something a little different. In doing some research before my trip, I discovered Sandan, one of the most highly rated restaurants in Sihanoukville. 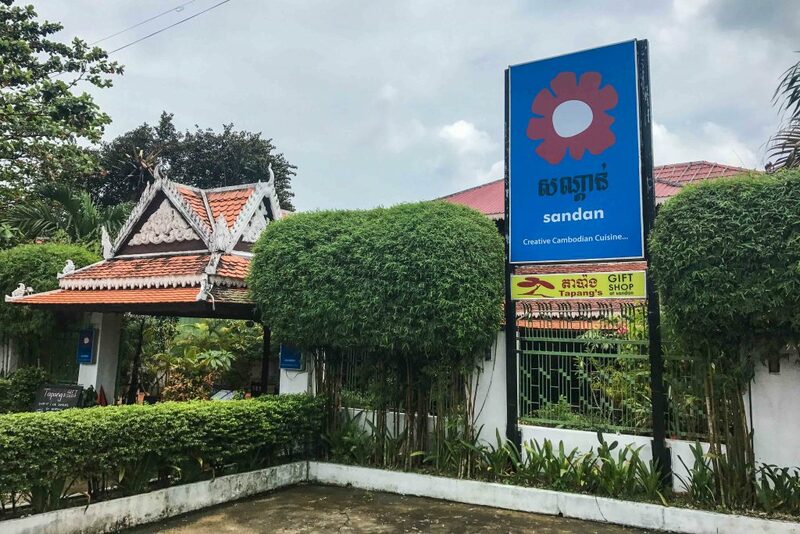 As it turns out, Sandan is part of the TREE Alliance, a network of non-profit restaurants that focus on providing world-class culinary and customer service training to young people from marginalized communities in Southeast Asia. And at Sandan, the training definitely shows. As I approached the entrance, a friendly server greeted me in easy-to-understand English and led me to a table, where I was promptly provided with water and a menu (yes, it sounds exactly like any restaurant experience you’d have in the U.S., but this level of customer service is unusual in Cambodia). 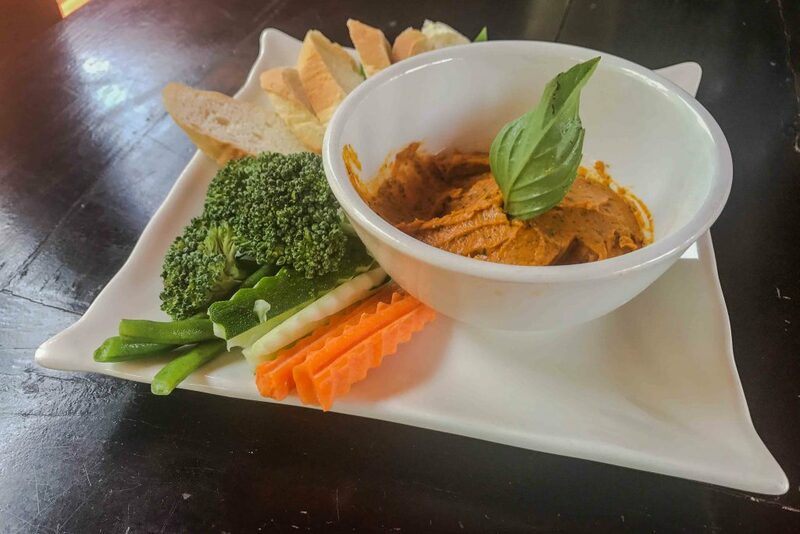 The culinary training must be just as effective, because their spicy red lentil hummus was the best hummus I’ve had in Southeast Asia. After my experience, I would highly recommend Sandan or any of their partner restaurants in Cambodia, Laos, and Myanmar. They’re a bit bit more expensive than other places, but it’s worth it for the delicious food and great service, and you can feel good about supporting a business that focuses on bettering the community. 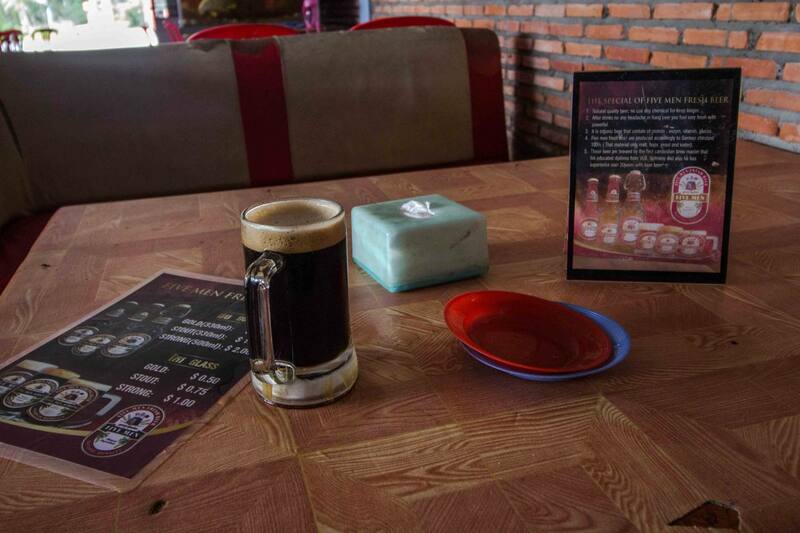 One of my goals (and I’m proud to say I succeeded at this) was to visit all of the breweries in Cambodia (there were only six at the time), and Sihanoukville had one of the more interesting ones with Five Men Fresh Beer. As in most Southeast Asian countries, it can be hard to find beers other than the few cheap, ubiquitous brews in Cambodia, all of which taste pretty much the same – very light. Five Men is trying to break this pattern by brewing three more flavorful options, but still selling them at nearly the same price as the mass-market beers (around $0.75/pint). I arrived at Five Men to find that I was the only customer. I didn’t let my lonely setting deter me, though, and ordered one of each of their beers: Gold, Stout, and Strong. While I wouldn’t give them any awards, three beers were only $2.25 altogether, and they tasted a whole lot better than the mass-market options available elsewhere. I also appreciated Five Men’s unique decor, which reminded me of a ramshackle pizza parlor from back home, complete with a very dirty aquarium up by the counter. After a few rounds of beers, I figured it was time to head to my hotel, which was a few miles away at Otres Beach – too far to walk. While Sihanoukville has a reputation for being a hard partying town, nearby Otres Beach is known for its hammocks and beach lounging (much more my style). Even if you stay in town, be sure you at least make it out to Otres for an afternoon. The easiest place to find a mototaxi or tuk-tuk out to Otres is at the Golden Lion Roundabout, but that’s also where you’ll have the toughest time negotiating. 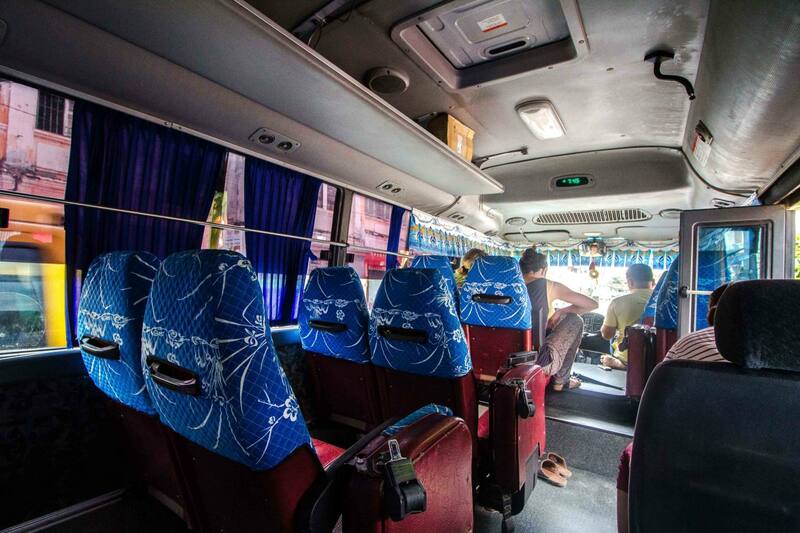 The drivers have loads of other potential customers getting off the buses nearby, but you can get a better deal by walking a little ways down Puolawi Street. In my case, after about twenty minutes of walking, an Italian expat picked me up and gave me a free ride, so I suppose the lesson is that patience is key (and that people are good). When choosing a hotel at Otres Beach, you’ll need to consider what kind of stay you want, as the development along the shore is split into two sections (unoriginally named Otres Beach 1 and Otres Beach 2) and divided by a mile of completely undeveloped beachfront. In fact, you can’t really call it a hotel. I spent the night at Otres Beach Camp, an open-air restaurant with a couple wooden platforms out on the beach where they set up small camping tents. Camping on the beach sounds like fun, right? Not when it’s rainy season. 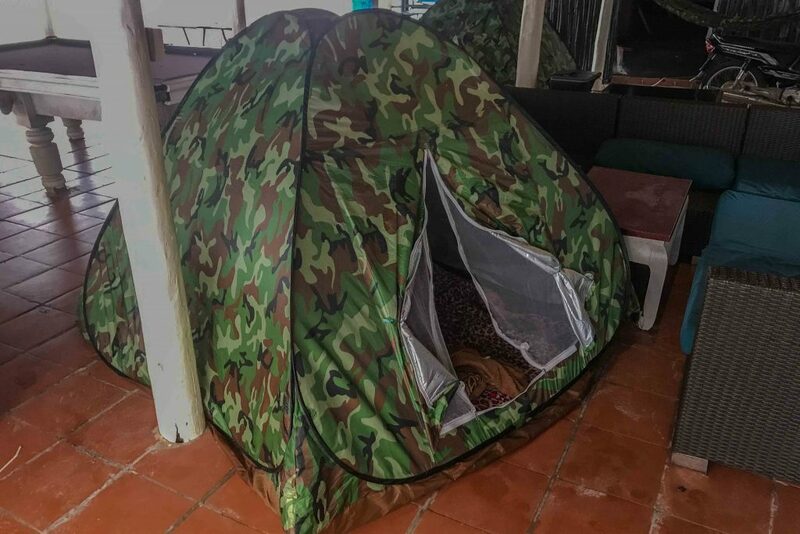 To keep me out of the weather, the staff moved my tent under the restaurant roof, which I definitely appreciated, although it made me feel like a kid who wants to go camping so badly that they set up a tent in their parents’ living room. It was an experience for sure, but there are plenty of other inexpensive options, like the Footprints Beach Hostel, if you’re looking for something less rustic. My hotel did have one thing going for it, though: two beautiful palm trees on the beach right in front. They didn’t have any hammocks set up for guests, but luckily, I brought my own. I realize not everyone would consider packing a hammock, but you should definitely start. They hardly even take up any space. I strung my hammock up between the trees, and spent a few hours enjoying the stunning purple and pink sunset, watching the waves roll in, and reading my Kindle. I also saw quite a few couples out enjoying the evening, walking hand in hand along the beach, which did make me wish Jen was there, too. But even if you don’t have a partner to enjoy a romantic sunset with, you’ll still enjoy walking along the water and taking in the view at this tranquil beach. Having exerted myself by lying in the hammock for a few hours, I was in desperate need of dinner. 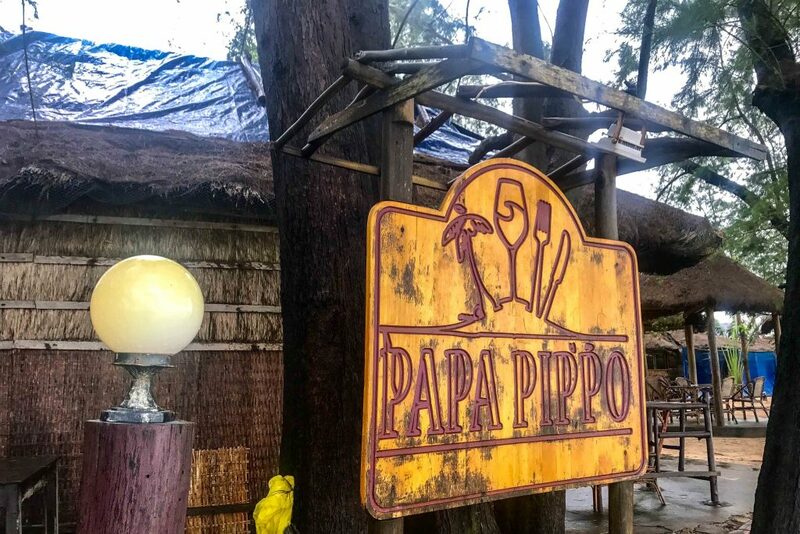 Before coming to Sihanoukville, I’d found Papa Pippo on TripAdvisor. As I was checking out their pizza menu online, I saw that they host trivia night on Tuesdays, and the winning team gets a free bottle of wine. What do you know? Tuesday was the one night I’d be there, sealing the deal. Some other beachgoers had also said this was the best pizza they’d had in Cambodia, I had to try it. Their tricolore pizza did not disappoint – a high-quality thin crust with just the right amount of crunch and chewiness, topped with cherry tomatoes, mozzarella, parmesan, and basil (though I’d still argue that Simple Things in Kampot still holds the title of best pizza in Cambodia). To top it off, I won the trivia night, somehow managing to beat out the other three teams all by myself. The questions seemed bafflingly easy at first (what is the official language of Cambodia? Hopefully anyone currently in Cambodia would be able to answer that), but they got increasingly harder (what song has the lyrics “Rock and roll to the beat of the funk fuzz…?” It’s “Can I Kick It” by A Tribe Called Quest, if you were wondering). Fortunately, the other teams were not sore losers, and I made a few friends to split the wine with before heading back to my tent for the night. If you ask me, there’s no better way to start the day than with some time in the water. Since I visited Sihanoukville in low season, there weren’t too many kayaks available for rent around Otres Beach 2, so I had to settle for a swim. Not that I’m complaining – a strong morning breeze made for some rather large waves and a very invigorating swim, which was just what I needed to start the day. If you visit during high season, though, you should definitely head over to the Otres Sailing Club to pick up a kayak ($6/hour). The most popular place to paddle is up the mangrove-lined river at the end of Otres Beach 2. Or if you’re feeling adventurous, you can head out into the ocean; it’s possible to kayak all the way out to the beautiful island of Koh Tres, a mile off shore. There’s great snorkeling here, so be sure to bring some gear, which is available for rent at some of the shops along Otres Beach. After a couple hours in the water, it was time to go back home to Kampot. I picked up some snacks, hailed a moto, and headed back to that garish golden lion statue. 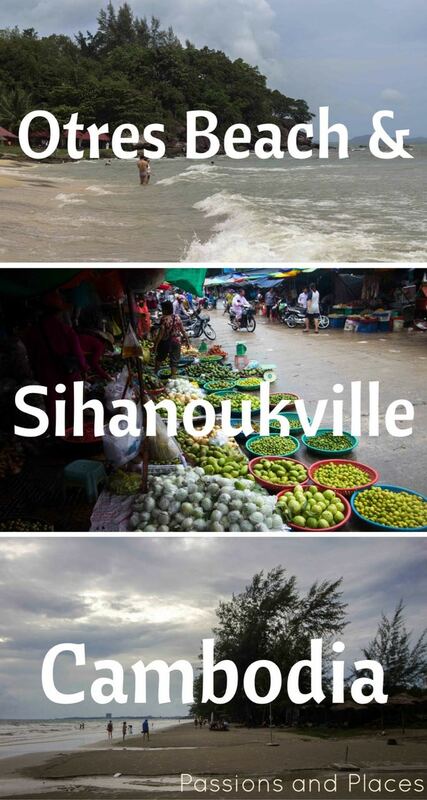 I left Sihanoukville unsure of how I felt spending such a short amount of time in such a popular town. What did I miss? Was I passing judgment too quickly on a place I’d seen so little of? I would have loved to visit on a weekend and see the Otres Village Market, which is known for having live music, lots of food vendors, and an upbeat party atmosphere. True to its name, you can also pick up all manner of local Cambodian knick-knacks to remember your time there. Unfortunately, the market and party only happens on Saturdays and only during the dry season. Looking back, Sihanoukville was admittedly not my favorite town in Southeast Asia, or even Cambodia (Kampot is a tough one to beat! ), but that doesn’t mean there’s nothing to appreciate there. While I may have only experienced it on the most superficial level, I found a lot to enjoy, and Otres Beach is truly stunning. If you have 24 hours to spare in your journey across the country, this area is certainly worth a visit. When’s the last time you went someplace for just one night? 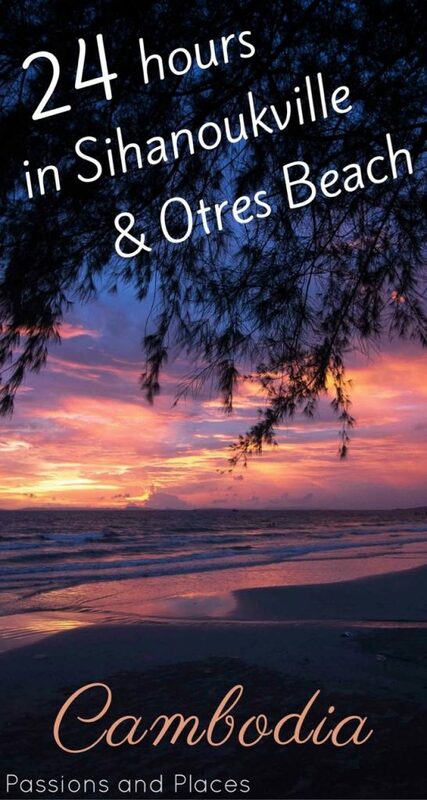 I’m sitting on Otres Beach right now and it is indeed the best beach around here by far and it is relatively clean, unlike Serendipity and to a degree Independence. As for for the Chinese investment… there are casinos and resorts being built all along the coastline and it’s deeply unpopular with the locals I hear. Sihanoukville is the new Macau! Finally, I went to the Five Men Brewpub last night. The beer was amongst the worst beers I’ve ever tasted. Truly awful. As for eating there, they had a fish tank from which you were supposed to choose your dinner, only the tank was so dirty that you could not even see the fish!! Prices are higher now…. it’s 2 Dollars for a glass of the dark alone. I read that this is because of the influx of Chinese tourists. I paid my bill and left. It’s a truly grim beer destination. I wanted to give Five Men Brewpub some credit for producing what I thought was an okay product compared to the Angkor and Cambodia brands, but I wouldn’t pay $2 for the dark (my least favorite of the three), though the strong wasn’t bad when it was a $1. However, it was not comparable to some of the places I mentioned in Phnom Penh (check out Kingdom if you have the chance) or Siem Reap. 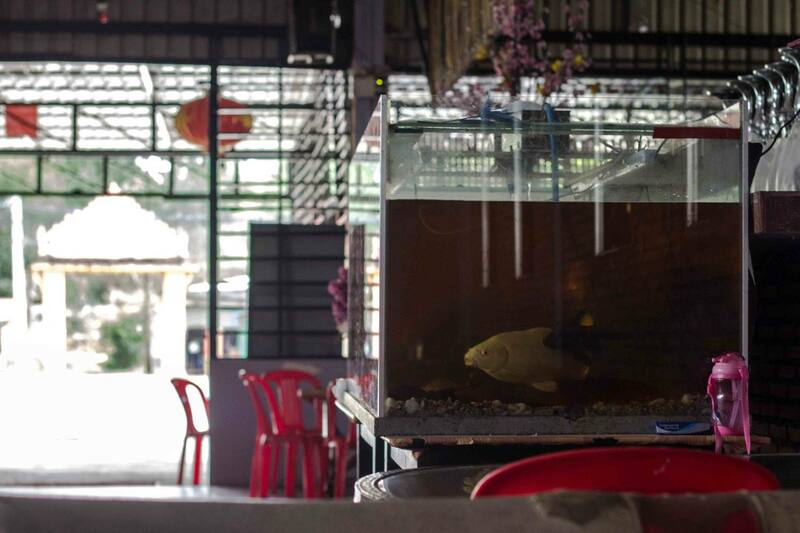 I had no idea that the fish in that tank were being served to customers, that’s disgusting. Maybe someone will open up a better brewery, but I wouldn’t count on it since it sounds like Sihanoukville is only going further downhill with more and more casinos. Glad you’re enjoying Otres though, it’s a lot of fun and far enough away from the development happening further down the beach. Hi Ryan, thank you for this! I’ve just read an article about Chinese investment in that part of Cambodia, including a massive casino development near Otres Beach… https://www.smh.com.au/world/asia/the-next-macau-china-s-big-gamble-in-cambodia-20180615-p4zlqg.html . Here’s an excerpt: “A dozen cranes are working 24 hours a day building what is believed to be a huge casino and condominium complex adjacent to Sihanoukville’s Otres Beach. The builder is China’s giant state-owned Yunnan Construction and Investment Group, but it is not known who owns the project.” Did you see any of these Chinese developments or notice Chinese workers clashing with the local Cambodians? I wondered if it was worth revisiting this area of Cambodia, or best to stay in India. Wow that article was depressing. I didn’t personally see the negative things mentioned in that article, just the ominous Chinese skyscrappers and casinos popping up. It really makes you think about the impact of tourism though. I disliked Sihanoukville for its old image as a drug-fuelled backpacker hangout, but that certainly beats the new development that’s happening. I was suprised by how many locals all around Southeast Asia told me that they’re scared of what the Chinese are doing. That’s something that doesn’t get a lot of attention in our media, but it’s a signal of how much geopolitics is changing. If you’ve been to Otres and Sihanoukville before, I think it might be very saddening to return and see what’s happening. Many thanks for your reply. I agree with your conclusion. So many countries that I used to love travelling in have come under the influence of China. However, India is less likely to so I will probably continue to spend most of my time here. Hahahah, I love India, and I’m pretty sure it will never again fall under any country’s thumb. We spent 3 weeks here at one of the hotels w/ A/C. Amazing, perfect, relaxing, and not to be missed. The cost was minimal – about what you would spend on a loud free-way hotel in the US for 5 nights. All of the restaurants in Otres 2 are amazing, most of them serve fresh caught red snapper or barracuda for $7 or so, and you can satisfy any dietary requirements in at least one or more of these restaurants. The most amazing part is you can walk everywhere, the roads are all sand, and you basically wear a bathing suit or sarong (day/night) the whole time you are there. Just perfect! Otres is a pretty amazing place, glad to hear you had a good time there. 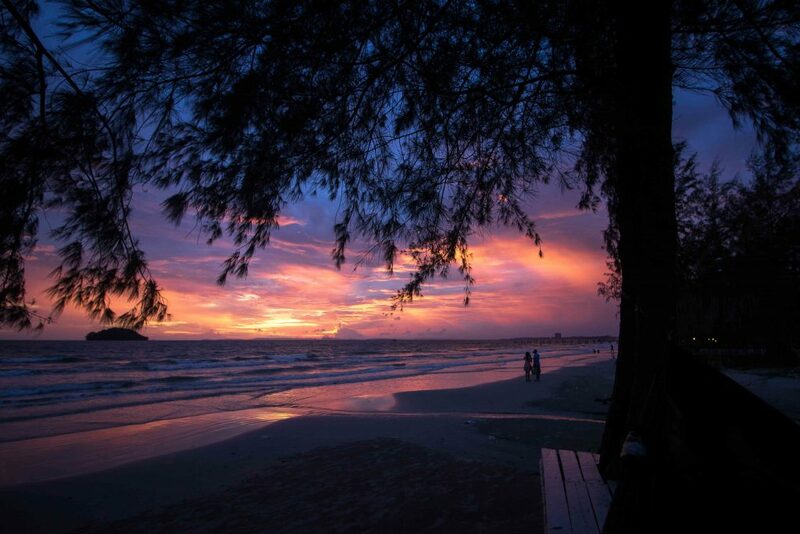 Awww – Sihanoukville has a very special place in my heart as I met my boyfriend on Serendipity Beach 10 years ago (when we were both young hedonistic backpackers). Great to see it again in your pictures. It is a special place and I think I would have really enjoyed the Serendipity Beach area if I was ten years younger, but at this point in my life I’m more of the quiet Otres Beach type. Adventurous place! I’ve never been but I love your photos. Thanks! I don’t know that I’d want to spend too much time in Sihanoukville, but I love taking short adventures to places I wouldn’t normally plan a trip to. Loved the bit on your camping in a restaurant overnighter. 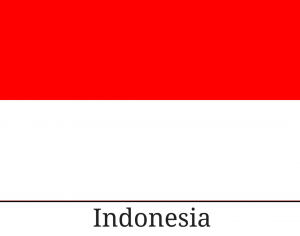 I do have the same impression that these beach and island getaways in Southeast Asia seems very homogenous but markets do help a lot in getting to know local people and the community. It was certainly an interesting experience, even if I didn’t get to fall asleep to the sounds of waves crashing on the beach. 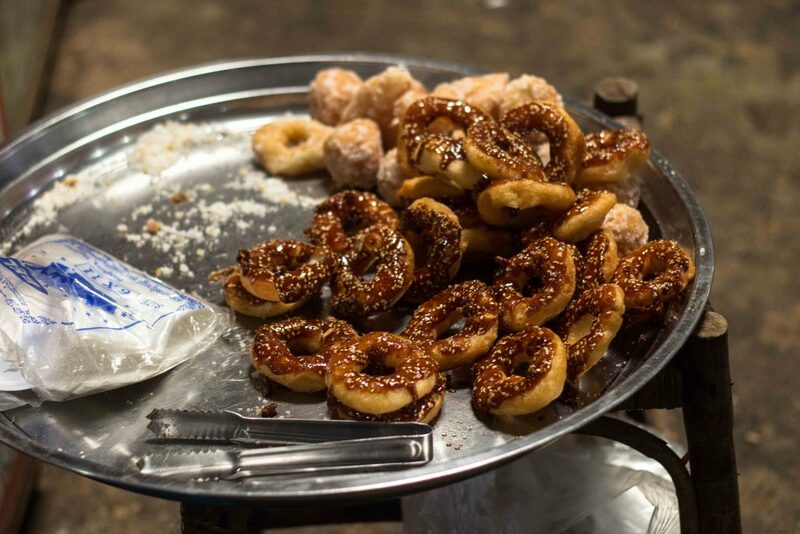 Oh this post is making me homesick for Cambodia! In the year and a half I lived there I spent two weeks in Otres. Love this place so much. It was definitely worth the trip and so happy that I was able to find some of the gems that make this place special! Your opening paragraph made me laugh. 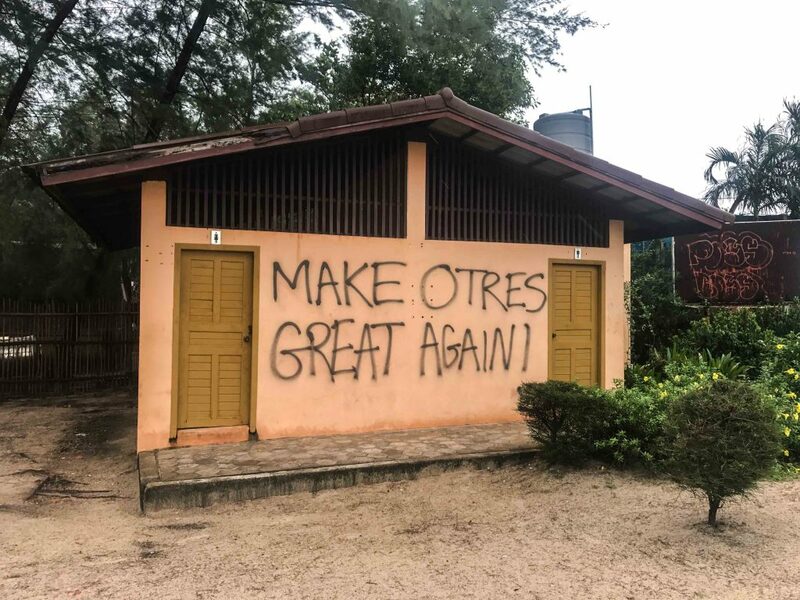 Love the make Otres great again sign. I saw one in Bulgaria. Too funny! 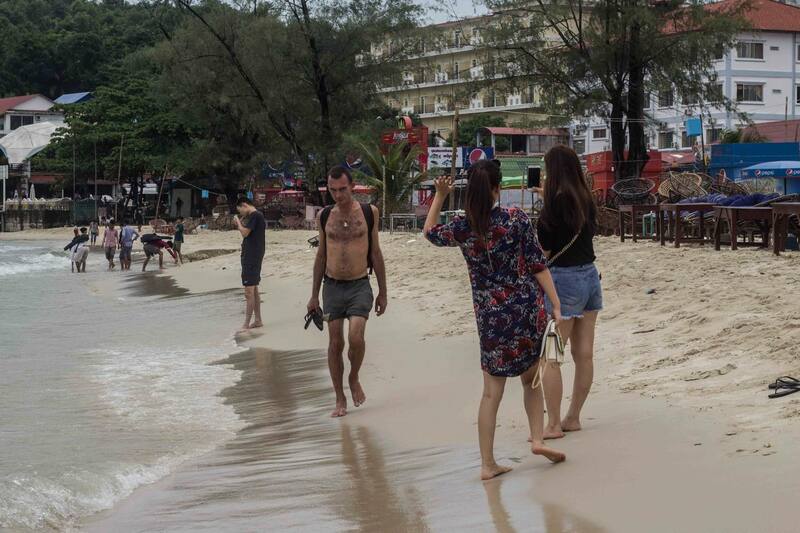 Hahah, it does paint a dark picture, but we can laugh at the bleakness and still enjoy the other things that Sihanoukville and Otres have to offer. Temples are great, but after a few months in Southeast Asia, it can feel like you’ve seen enough for a while. Otres Beach was a nice change of pace too. Great itinerary! We’re heading to Cambodia later this year and hope to check out this area but maybe just as for a day! Did you visit any of the islands? Sadly I did not visit the islands, the weather was quite bad when I was down on the coast (August) so it probably wouldn’t have been worth the trip. However, I’ve hear they’re amazing, and we hope to visit them some time during our travels.